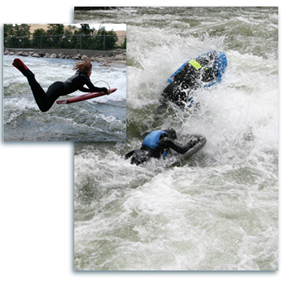 Opinions expressed on this site are solely mine, one bodyboarder turned riverboarder who still bodyboards. I got on a riverboard in 2005 thanks to Josh Galt of Face Level Industries, who was demonstrating riverboarding at a festival in Cashmere, Washington. I didn't get hooked until a few years later, at the Gorge Games in 2008. If you would like to be linked from this site and/ or have something to contribute by all means let me know (unless you're selling viagra). There's a fantastic social networking web site to meet other riverboarders around the world.